Romantic tenor Sergio Franchi was born in Italy; during a career spanning close to three decades he won acclaim not only as an entertainer but also as a humanitarian, earning the title of «Cavaliery» from the Italian government. 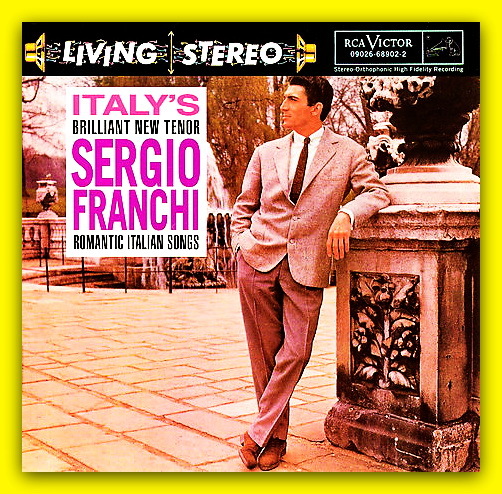 Becoming an American citizen in 1972, Franchi issued a series of recordings for RCA before succumbing to cancer on May 1, 1990; in the wake of his death, his widow Eva established the Sergio Franchi Music Foundation, annually awarding scholarships to students of vocal studies. 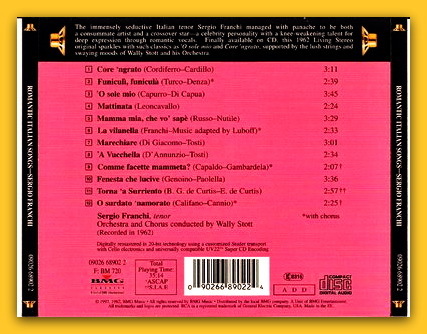 Sergio Franchi: Romantic Italian Songs. Digitelly remastered in BMG/RCA Studios, New York City. ©1997, 1962 BMG Music. An RCA Victor recording licensed from BMG Music. Sergio Franchi courtesy of BMG Music. Tracks 2, 9 and 11 with Chorus.